Pros and cons of midblock crossings. Advantages of using medians with midblock crossings. 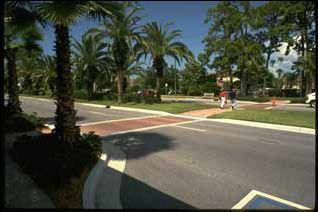 Design considerations for using medians with midblock crossings. Where midblock crossings should be allowed. Concentrate pedestrians crossings in one central location. Cost less to build and maintain. High-speed suburban roadways create challenging conflicts. Motorist do not expect midblock crossings. Motorist do not always yield at midblock crossings. Arterials with six or more lanes. 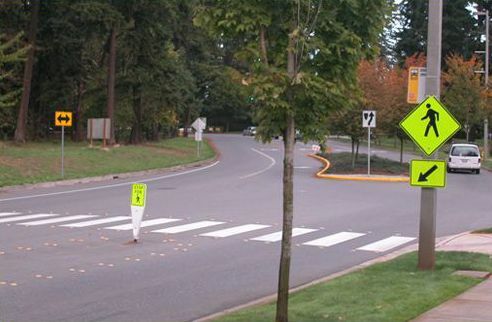 Use of same techniques as in lesson 10 (various crosswalk types, signs, signals and markings). 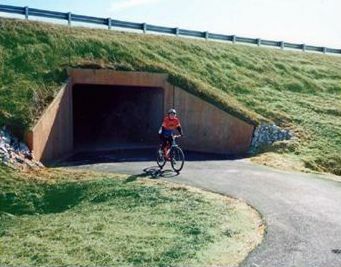 Curb extensions to reduce crossing distance. -	2.4 m (8 ft) desirable. -	0.6 m (2 ft) minimum. Sources: Southeast Neighborhood Traffic Management Plan, Vancouver, WA, and Bicycle Facilities Guide: Types of Bicycle Accommodations. Midblock crossings can be an effective part of the overall pedestrian network. 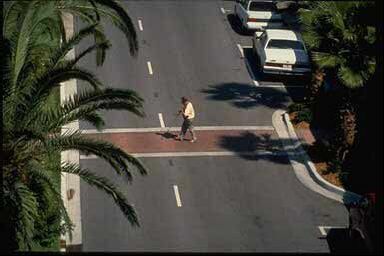 Midblock crossings can be created by using simple designs and logical guidelines.